This “fiery ode to boyhood” (Scott Simon, NPR) tracks three brothers as they tear their way through childhood, growing up in the shadow of Paps and Ma and learning a kind of love that is serious, dangerous, unshakeable, glorious. A stunning exploration of how we are formed by our earliest bonds, We the Animals bears witness to Justin Torres’s serious talent and heralds him as a “brilliant, ferocious new voice” (Michael Cunningham). 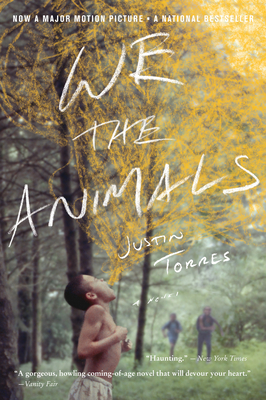 JUSTIN TORRES's first novel We the Animals, a national bestseller, has been translated into fifteen languages and is now a feature film. He has published short fiction in The New Yorker, Harper's, Granta, Tin House, The Washington Post, Glimmer Train, Flaunt,and other publications, as well as non-fiction pieces in publications like The Guardian and The Advocate. A graduate of the Iowa Writers’ Workshop, he was a Wallace Stegner Fellow at Stanford University, a fellow at the Radcliffe Institute for Advanced Study at Harvard, and a Cullman Center Fellow at The New York Public Library. The National Book Foundation named him one of 2012's 5 Under 35. He has been the recipient of a grant from the National Endownment for the Arts, a Rolón Fellowship in Literature from United States Artists, and the VCU Cabell First Novelist Award. Recently, he served as Picador Guest Professor for Literature at the University of Leipzig. He lives in Los Angeles, where he is Assistant Professor of English at UCLA.